The United States (US) Senate has voted to confirm Philip Goldberg, a veteran career diplomat, as the country’s next ambassador to the Philippines last November 14. Goldberg, a former ambassador to Bolivia, will succeed Harry K. Thomas, the first African-American to hold the said post. The US Senate website did not disclose though how the exactly the confirmation vote went. Thomas served as the top American envoy to Manila from May 2010 until his departure last month. Goldberg is expected to present his credentials to President Benigno Aquino III possibly before 2013 ends. 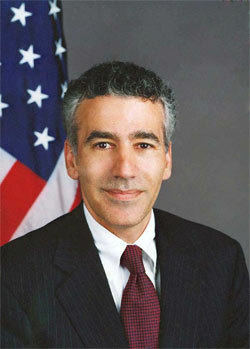 Goldberg was confirmed on the same day as James Brewster Jr., the next US ambassador to the Dominican Republic. Brewster is only the fifth openly gay man to serve as a US ambassador, one report noted. Goldberg will have his hands full upon his arrival to the Philippines. As per the directive of President Barack Obama, the United States government is deeply involved in the relief efforts for the survivors of super typhoon Yolanda (international code name ‘Haiyan’), especially in the Eastern Visayas region. Obama last week announced during a White House press briefing that aircraft carrier USS George Washington will be coming over to the Philippines to assist in the recovery efforts. “Our friends in the Philippines will face a long hard road ahead, but they’ll continue to have a friend and partner in the United States of America,” he said. Read the full statement of President Obama in this link. He also urged Americans to visit www.WhiteHouse.gov/typhoon, a web portal meant to raise donations for super typhoon Yolanda survivors. As of the moment, US Embassy Chargé d’Affaires Brian Goldbeck is the one supervising the American relief initiatives in the disaster-stricken areas. PLEASE LIKE THE FILIPINO SCRIBE ON FACEBOOK! This entry was posted on Sunday, November 17th, 2013 at 8:45 pm	and tagged with barack obama typhoon haiyan, philip goldberg, philip goldberg ambassador, philip goldberg barack obama, philip goldberg biography, philip goldberg philippines, philip goldberg united states ambassador and posted in journalism, philippines, politics. You can follow any responses to this entry through the RSS 2.0 feed. « Aquino’s animosity toward Tacloban mayor hampering relief efforts? Perhaps, the new US Ambassador to the Philippines shall also look into the latest news report from CNN’s I-Report that there are alleged ‘tampering’ of US donations to the Yolanda ravaged areas in Eastern Visayas and Panay Island! Coco Martin, Matteo Guidicelli, and RAGING HORMONES!